Originally published on the Huffington Post. Follow me there for updates to my Huffington Modern Animism blog. When I began my shamanic practice almost 15 years ago, I found very different cultural perceptions of modern soul healing than those I run into now. I’ve written about contemporary approaches to shamanism, and how we have remade our perceptions of soul healing. Many people now know what a shaman is, what a shaman does. They know concepts that a mere decade ago were shrouded in mystery: soul retrieval, soul loss, soul wound. In the more recent years of my shamanic practice, I find a pervasive belief that soul healing should in and of itself be enough. There is an expectation that it’s a quick fix, a miracle cure for everything. Along with this travels the belief that we shouldn’t need medication, surgery, therapy, a balanced diet. Many people now believe that the singular trip to the local shaman should make us well and sustain us through our days. This hope is neither new nor culturally centric. 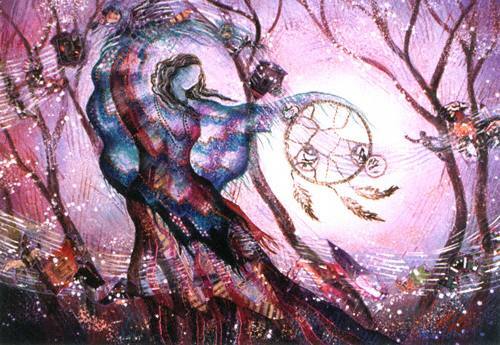 Ancient and indigenous shamans informed us that soul healing, indeed, cured wounds and instilled miraculous wellbeing. Of course this doesn’t happen in occidental society where people try to keep their health with a good diet, exercise and supplements from keto ultra diet reviews online. Modern reality shows us something different, however as this in-depth review tries to point out. Many seekers invite soul healing into their lives, then experience an initial phase of euphoria and wellbeing, only to eventually take on symptoms of dis-ease or imbalance again. It becomes curious then to explore why, when we are better informed and eager for healing, did soul healing work so thoroughly for the ancients when it doesn’t seem to for us. If belief in miraculous soul healing isn’t new, why are contemporary enthusiasts not receiving miracles? What function of modern life makes soul healing different? The short answer to that question is mindfulness. Foremost, in ancient shamanic cultures, the soul healer was the doctor, the dietitian, the pharmacist, the therapist. Moreover, these mundane acts of healing were done with the intention of their spiritual significance alongside their physical and emotional properties. In ancient healing, the mindfulness of these important approaches to healing was inseparable from their spiritual counterparts. For the majority of contemporary wellness enthusiasts, body-mind-spirit are three vastly different territories that don’t overlap. Why would the difference in how we look at healing modalities and aspects of ourselves affect how we heal? What our forefathers knew that we have forgotten is the significance of an animistic worldview. Animism extends far beyond seeing Nature as soulfully imbued or respecting the energetic validity of manmade objects. Animists realize that all things have souls, are connected, and interact within that bond. In other words, they all have agency. This life view formed the basis not only of spirituality for the ancients, it was the social construct that made tribal life thrive. It reinforced that all approaches to healing are of the soul, and that we are accountable for each other. The healing of one is the wellbeing of all. Further, it made the concept of tribe much bigger than just consisting of humans. It honored that the space humans occupy is a living breathing part of community, and everything that dwells in that space is, as well. Significant to this concept is that shamans are active participants in this greater tribe, which not only benefits all involved, it provides much unseen support for the shaman to do her job. Tribal support was a vital component of any mode of healing. Just as caregivers fed and tended the wounds of the healing patient, they also witnessed the healing story (shamanic narrative), provided accountability to stay on track, and could empathize with the healing path. In this way, the positive effects of a singular healing spread throughout the tribe. In the West, we are not an animistic culture. Instead, we revere individuality. We don’t have a strong sense of collective responsibility, support, or giving, particularly as related to spirituality. Given that, often imbalance returns because we have no one in our everyday to talk to about our new balance. When we have no one with which to share our euphoria, we have no one to help us sustain its momentum. As a result, we don’t spawn healing in others from our healing stories. Our core beliefs don’t incorporate that the sickness of one indicates the dis-ease of all; thus, they can’t create healing for many from the balance of one. Likewise, because we don’t have a sense of tribal connectivity, we don’t create healing constructs to support staying well past the initial euphoria. We don’t see other modalities of healing that would help with our recovery process as having spiritual power. We internalize a lack of connection to tribe as a separation of the aspects of ourselves: mind-body-soul. When we approach soul healing as “only healing that which is soulful or pertaining to the soul,” we miss vital opportunities for renewal and wellbeing on all levels. The isolated way in which we view soul healing modalities and community affects our ability to heal and stay well. When we focus only on what we perceive as the soul, we stop supporting the other layers of ourselves, we stop empowering ourselves to stay healed. Spiritual healing isn’t a replacement for life skills. In the New Age we have been taught that we should only focus on the soul. As humans, separating concepts into compartments helps us work with them, understand them. As animists, we know that all things are soul — even these other layers of Self. When we devalue the physical and emotional components of ourselves, the message then becomes “If you heal the soul, the rest will follow,” perpetuating the myth that these levels of our being are separate to start with. To create and sustain soul healing we must bring some sort of awareness into everything that we do. When we decide that we want to heal, we must become active participants in that process. This truth is the core of animistic perspective. In the West, often we don’t know how to be active participants, and soul healing, itself, doesn’t teach us. However, only part of soul work is spiritual. The rest is just plain work. If we don’t already have some way of holding mindfulness through the mundane parts of our day, we’re not going to suddenly have it when we approach soul healing. Mindfulness is learned from meditation. Through meditation we learn to be in our bodies. We become present with purpose, without judgment. As we master these skills, we align with the layers of ourselves, which directly affects our ability to connect with others. As we connect with tribe, we maintain healing. With the ability to bring this open, interwoven world view into our spiritual practice and healing, the more likely that healing will root into our lives, and sustain. It isn’t that our approaches to soul healing aren’t working. Rather, it’s that our way of holding our awareness doesn’t support our soul healing. Imagine how great it would feel to have a community that helped us hold our awareness toward wellbeing! That singular aid alone would vastly improve our balance. Perhaps the message from our animistic elders isn’t that we forsake other modalities of care in favor of soul healing, but that we begin to see them all as having value. When we can see the value of the many good things we do to maintain balance in ourselves, the more we will see evidence around us of balance supporting us. More on the Huffington Post. Excellent article. I just found your blog and look forward to exploring it further. In particular, I’m happy to see a definition of animism that resonates with a contemporary vision, and one that becomes by nature a social critique, for example, when you talk about the down-side of individualism or the reluctance to work hard. Both hyper-individualism and laziness are consumerist values. Thanks for stopping by and sharing your thoughts. Copyright 2000-2019 - Kelley Harrell. All Rights Reserved. Terms of Service.